Why would a school teacher walk into a packed assembly hall and shoot two pupils and a colleague before turning the gun on himself? Detective Inspector Lucia May wants to find out but her bosses and the headmaster of the school seem happy enough to believe that this was just a moment of madness in the life of a loner. Lucia manages to negotiate a few days grace before she must submit her report and starts to interview those who knew the gunman. As her investigation progresses Lucia puts together a shocking picture of a man tormented to the very brink. Simon Lelic’s debut novel is a dramatic and, at times, highly moving, look at bullying, more precisely institutional bullying, and asks the question how far are organizations responsible for the behaviour of their members. If that sounds weighty and too philosophical that’s a disservice to the author who has chosen such an interesting way of presenting the story – and telling it so expertly – that the reader is sucked into the story instantly and is carried along on a wave of first intrigue and later anger. The narration alternates between Lucia’s perspective of the investigation – a conventional third person narrative – and a series of interviews given to Lucia by witnesses of the shooting and people who knew the school teacher Samuel Szajkowski. With each new account the sketchy outline of the story is given more detail; in fact, the first statement is almost entirely hearsay, coming from a pupil who was truanting at the time of the incident. Using so many different voices to tell the story could become tiresome or confusing but happily, turns out to be neither. Each character is so well captured that it doesn’t take long to become engrossed in the next interview. The interviews are presented as monologues so, although we don’t get to hear directly what the questions are or how the speaker is being prompted, we can get the gist of it from the speakers responses. As Lucia has more interviews to work on, so to of course do you, the reader; just when you think you’ve made your mind up, a new witness makes you think again. 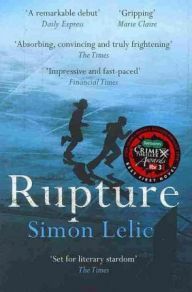 Simon Lelic is clearly a talent to watch; in particular, the skill with which he creates such strong characters from short monologues is remarkable. There are no superfluous details yet the overall effect is richly vivid. A sub plot showing how Lucia is the victim of intense bullying at her own workplace is handled less well and the ending is undeniably clunky but ultimately this is gripping stuff and it’s chillingly frighteningly realistic. Lelic tackles various issues but manages to keep entertainment as his top priority while still providing plenty to think about.